For various reasons, well beyond the scope of this short note, China has amassed huge industrial capacity, well beyond its ability to absorb. In part, that is one of the challenges that the "One Belt One Road" addresses. Export the spare capacity by building infrastructure, networking east and central Asia (included parts of the former Soviet Union and the Middle East. Even that long-term project does not appear sufficient to absorb the existing surplus capacity. Many US and European officials in the public and private sectors fear that to maintain employment and domestic social stability China will seek to export their surplus. The steel sector is likely the leading edge in this confrontation. The steel industries in Europe and the US are well organized, with years of experience lobbying and seeking government readdress, and experience their own challenges. 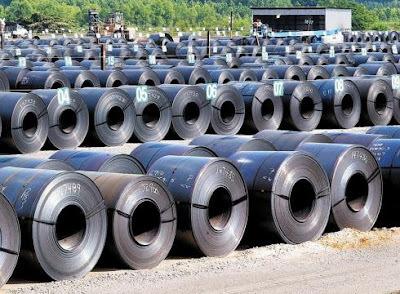 US Steel Corp persuaded the US International Trade Commission to proceed with an investigation into charges that Chinese steel companies have colluded to fix prices, stolen trade secrets and evaded duties by mislabeling exports. The issue will now be heard by an administrative judge. The process may take more than a year to complete. And even then, the US Trade Representative can over-rule the decision. Two years ago, the US Justice Department indicted five PRC military officers for allegedly stealing technology via cyber-espionage from US steel companies. Domestic consumers of steel testified against the US Steel complaint. They argued that US producers do not want to or cannot make the steel products they need. Some consumers also argued that the quality of domestic output lagged behind the imports. Some 13,500 US steelworkers have lost their jobs, and imports are an easily named culprit. Steel imports from China account for less than 5% of the total finished steel imports. Broadly speaking, a recent study found that technology accounts for more than 80% of the jobs lost in the manufacturing sector. Still, the growing complaints of US producers and the threat of retaliation appear to have had a cooling effect. Steel imports from China fell 70% in the first four months of the year while overall US steel imports have fallen by a third. To be sure, the US-China issue is only one element of this multifaceted issue. Yesterday, the US Department of Commerce's ITC announced anti-dumping duties on producers (cold rolled steel) from India, Korea, Taiwan, Italy, as well as China. For example, the dumping margin on Hyundai Steel was set at 47.8%, and 8.75% for Dongkuk Steel Mill, and 31.7% on all other Korean producers. The dumping duty on Italy's Marcegaglia was set at 92.1%, while all others from Italy, the duty was set at 12.6%. The ITC will make its final decision by July 8. There is some political pressure to widen the "trade-enforcement" to include other varieties of steel, including corrosion resistant, hot-rolled, and stainless steel. It is also interesting that foreign producers, with a US presence, like ArcelorMittal also participated with US Steel in filing the petitions. Although some officials and journalists may spin a narrative that emphasizes the Sino-American confrontation, this would seem to be an exaggeration. For sure it is one dimension but does not do the complicated issue justice. The US has found Japanese producers guilty of dumping cold-rolled steel too. Other countries being investigated are American allies on other issues. US Steel (X) stock closed 3.3% higher yesterday. Coming into today's session, it is up 10.4% on the week. It finished last year near $8 a share and closed yesterday at $14.75. It is recovering from a slide earlier this month that brought it from $20.30 on May 2 to a low near $12.75 last week. The stock gapped higher yesterday but closed near its lows, leaving a small gap unfilled. With ITC showing favor, the US steel sector may have a modest reprieve, just in time for corporate treasurers to get concerned about a rising dollar. For earlier post on the steel industry see Stealing Steel.